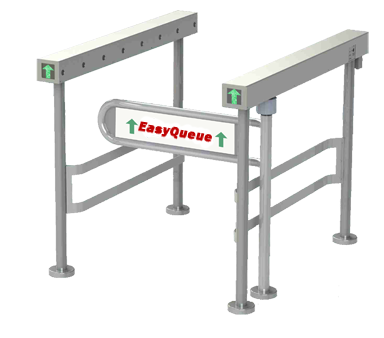 Stanchion carts make the transportation of crowd control applications quick and easy. The setup and take down of queue lines becomes a simple and effective task. Easy Queue 2980 muliple transportable cart is designed to safely transport posts in public areas for ever changing configurations. It can hold up to 10 posts each and are also used for tempoary storage.Up to 3 carts are easily coupled togeter and 30 posts may be moved by one person. The model 2981 is a single stage cart transporter. Both models are equipped with 2 brakes, rubber non-scuffing solid tires, rubber edge banding to protect walls, and low center of gravity for ease of loading and safety. 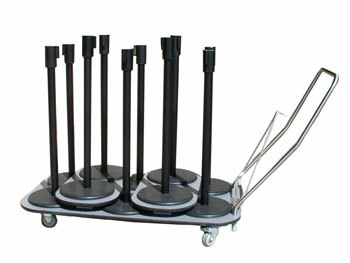 Please contact us with inquiries about stanchion carts. Mulitple stage cart transporter with triangle towing bars shown.